Glenn Lowson is a photojournalist at the core, working for the major Toronto papers and shooting news stories throughout the Golden Horseshoe region. His home, as well as his heart, however, is here in his adopted home town of Hamilton. For a couple of years now Glenn has turned his lens, in the form of an iphone, on our city, shooting both the people (HAMMERHEADS) and landscape (A PORTRAIT IN PASSING). 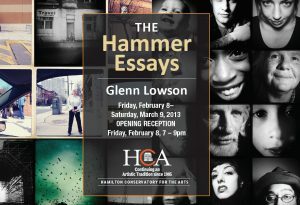 These two ongoing essays are combined and presented here for the first time as: THE HAMMER ESSAYS.